I should be old enough to know better, but after weeks of ignoring nagging voices telling me Primal Plate must be “GDPR-ready” before 25 May 2018, I finally succumbed to the general confusion by sending out an email to all our blog subscribers, which essentially promised to unsubscribe them by default! Oh, how I despise bureaucracy. Does anyone else recall the ridiculous, government-led Y2K millennium bug scaremongering that told us to prepare for the worst? It was all for naught. And what about the TPS (telephone preference service) that supposedly allows residential phone users to register their wish to opt-out of receiving cold calls? In the nineteen years since we signed up it hasn’t made a jot of difference to the number of nuisance calls we receive. Whilst I agree it’s a good thing to have control over who holds my personal information and for what purpose, I think the hoo-ha and perceived threat of this latest EU legislation is just another sledge hammer to crack a nut. The fact is that data protection enforcement has been extremely lax to date and although, in theory, fines of £500k can be imposed on anyone found flouting the law, I‘m willing to bet no-one will be around to successfully police it. Rant over. If you’re reading this blog, I’m happy you’re still with us and my apologies for last week’s needless attempts to put right your current subscription status, which was never wrong to begin with. If fathoming out GDPR cost me two days of my life this week, yesterday was a complete wipe-out. I was quietly doing my usual morning face-cleansing ritual in front of my magnifying mirror when to my horror, I sat and watched my right eye - as if in slow motion - fill up with blood! No warning, no obvious reason, no pain, no loss of vision but hell’s teeth, it was frightening! Feeling too faint and too scared to go online to investigate, I was left in a state of shock. Was my brain seeping blood? Was I about to have a stroke? Was my bloodied eye permanently damaged? I had never seen or heard of anyone suffering a trauma as unexpected and dramatic-looking before, so when my husband told me I’d had a subconjunctival haemorrhage and it was completely benign, I was both thankful and relieved. Nevertheless, I took it as a warning to slow down and rest. As someone who can accurately be described as health obsessed, it’s humbling to know I’m not always on point. I share my experience with you because I believe that stress was the most likely cause of my eye ‘pop’. It’s a reminder that the true “price of anything is the amount of life you exchange for it” (saith Henry David Thoreau). From now on I will be more selective! In the spirit of ‘rest and restore’, I’ve turned to Sabrina Ghayour’s book entitled Feast for today’s recipe for Cheddar & Feta Frittata. A frittata is such a cheap, quick and easy, low-carb, keto meal to prepare and you can use almost any combination of seasonal vegetables with the eggs and cheese and have dinner on the table within half an hour. If I’m feeling really lazy, I don’t even bother with a salad accompaniment. I segment the sizzling frittata still in its pan and simply serve wedges of it with a glass of wine. There are lots of different frittata combos that we enjoy - leeks and blue cheese is another winner - but for now this Cheddar & Feta Frittata with peppers, fresh herbs and chilli should get you into the frittata groove. Wash the peppers, halve lengthwise and remove the stems, seeds and membranes, then cut into 1 cm strips and finally into 1cm dice. Place the ghee (or oil) into a large, non-stick ovenproof frying pan and set over a medium-high heat. When the oil is hot, add the peppers and stir fry for 2-3 minutes until softened, but not coloured. Set aside to cool. Meanwhile crack the eggs into a medium-large bowl and beat together well. Mix in the spring onions, feta, Cheddar, crushed chilli/chilli flakes, dill and coriander. Add the cooked and cooled pepper pieces to the eggs and mix again. Set the frying pan back over a medium heat - add a little more ghee/oil if you think it needs it. When the pan is hot, tip the egg mixture into the pan, spreading the contents out evenly with a wooden spoon. 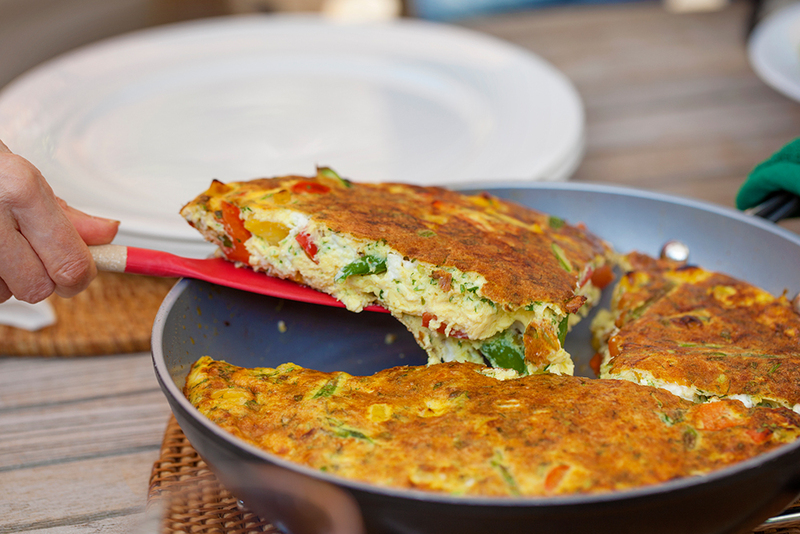 Cover the pan with a lid or stainless steel splatter guard and leave the frittata to cook on the top of the stove for 6-8 minutes or until the edges have set. Remove the pan lid and place the frittata under the hot grill. Cook until golden brown and sizzling hot. Check to see that the eggs are cooked through by inserting a knife into the centre of the frittata. If they’re still runny, put back under the grill for 1-2 minutes more until they’ve firmed up completely. Slice and serve straight from the pan. You will see from the photos that I ring the changes with whatever vegetables I have to hand. I’ve added lightly steamed rainbow chard to one of the frittatas and lightly steamed English asparagus to another. I could equally be tempted to throw in a couple of handfuls of baby spinach. 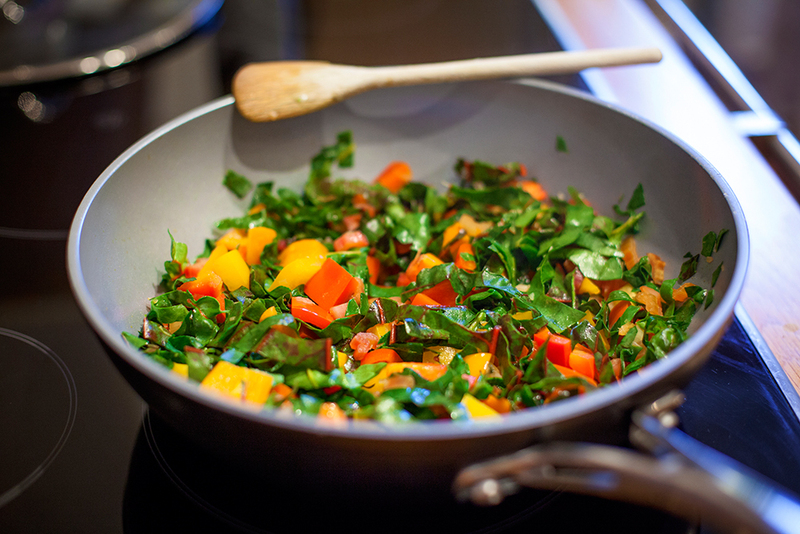 The more green veggies the better, just don’t overcook them before adding to the eggs. Leftovers are great served at room temperature.